Adapted from images by Luca_Luppi and Tom Gowanlock at Shutterstock.com. 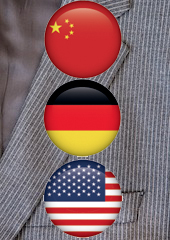 One way or another, China, Germany, and the US lead the global economy at the moment. China needs to begin developing a management system and a culture for technological and product innovation. Germany and the U.S. offer China the two main (and quite contrasting) models for the road ahead. The democracy-innovation nexus should not be overstated. German firms were innovative long before democratization. The focus on harmony makes it more likely for China to follow in Germany’s footsteps. China’s state-owned enterprises, whether privatized yet or not, are more German than American in their character. Privately owned Chinese firms are bound to follow the more top-down US model. For the United States and Germany, strong multinational corporations and technological innovation are the driving factors. In the case of the United States, innovation is driven by a can-do spirit and a healthy appetite for risk, with established corporations and startups introducing some of the world’s most important and game-changing technologies. In Germany, a commitment to product quality and engineering excellence has been key both for multinationals and small- and medium-sized enterprises (SMEs). Up to this point, China’s economic development has been focused on cost competitiveness and the adoption of foreign-developed technologies and innovations. Its global impact has been due mainly to its massive scale. The global financial crisis, however, marked the beginning of a new period in China’s modern economic history. China can no longer rely predominantly on foreign consumption as an engine for growth. It has to develop domestic consumer markets and orient its production towards them. Furthermore, rising wage costs make it highly unlikely that China can continue to grow by being the factory for many of the world’s simpler products. To move itself forward and to move up the value chain, China needs to begin developing a management system and, more important, a culture for technological and product innovation. Germany and the U.S. offer the two main – and quite contrasting — models. This is not to say that German and U.S. firms’ management is perfect. The U.S. economy had to overcome a love affair with bureaucratic capitalism that culminated in the 1980s. It did that through the rise of startups that were willing to be first movers and take risks on entirely new product categories and technologies. While being a first mover does not guarantee success, the U.S. business community benefits from a long tradition of newcomers leapfrogging companies that have lost their competitive edge. One need only look at the technology industry for a basic idea of how this process plays out. Another trait of U.S. firms is that decisions are usually made in a top-down fashion, depending only on one or a few leaders’ approval, which can allow for rapid adaptation and changes in direction. The advantages of the U.S. approach to managing innovation are quicker market penetration of new products, broad brand recognition in new markets, and attention to customer feedback which can be used to improve future generations of products. The weakness, one could argue, is that product quality may suffer, leaving the door open for other firms (possibly from other nations) to step in. German corporations have historically been big innovators in terms of technology and product quality. However, because of cultural resistance to risk and a widespread preference for stability, larger German corporations of late have not been able to capitalize on new ideas to as great a degree as American ones. Management in German firms is also much more horizontally organized. If a decision to take on risk or innovate is to be made, it must be approved in a time-consuming process by multiple individuals or groups. And even after it’s been decided at the top, the process may be slowed by levels below if there is insufficient buy-in. The advantages of the German approach to managing innovation are high product quality and well thought out services that accompany those products. The downside is that new products can be late to market, which can lead firms’ products to become an afterthought in the minds of customers. This tendency to procrastinate is fortunately much less pronounced in Germany’s more nimble SMEs. These Mittelstand firms live or die by how well they do in global markets. As high-cost firms, they must always be on the cutting edge of innovation. That is why it is fair to say that in Germany, companies’ innovation potential tends to be the higher the smaller their size. A common critique of this “minnovation” approach is that German firms rarely engage in innovations that are of a truly disruptive nature. And, even if they are on to the big ideas, they may miss discovering their immense market potential (witness the MP3 player saga). A predilection for disruption and an emphasis on rapid scaling up are more in the U.S. psyche. It is important to keep in mind, though, that as far as market and sales potential are concerned, the German approach – while more restrained – can be very lucrative and self-sustaining for a long while. What does this mean with regard to China’s future path? In both the U.S. and Germany models, the argument is often made that the freer people are in a society or an economy, the more innovation is likely to result. Innovation is bound to happen when people are taught from a young age to challenge the norm. That notion does not seem to augur well for today’s China. However, the democracy-innovation nexus should not be overstated. Historically speaking, German companies displayed an innovative spirit long before the country was a democracy. That suggests that democracy is not necessarily a requirement for innovation. That part of the historic record sounds like potential good news for today’s China. But it is crucial to recall what Germany did have as assets at the time: a strong engineering tradition, a strong adherence to the rule of law as well as a quickly rising focus on intellectual property rights. On that basis, risk taking and innovation were properly rewarded. Today’s China, though, does not yet have the engineering and legal traditions Germany has. It also still lacks on the other key ingredients in the innovation formula. How about Chinese firms finding inspiration in the U.S. model? The trait that Chinese firms share with U.S. ones is the ability and inclination to bring a new product to market quickly, although generally still at a low level of product sophistication. Where Chinese firms still have a lot of catching up to do is in making adjustments based on customer feedback after a product hits the market. Bringing a new product to market rapidly and improving its quality based on empirical evidence from customers is the true value of the U.S. approach. It stands to reason that Chinese firms will manage to absorb that lesson before long. The continental size of the Chinese market and the increasing sophistication and quality demands of Chinese consumers will likely ensure that. Still, that does not yet solve Chinese firms’ problems of indigenous innovation. The big question is how and where they can find their own equivalent of the Yankee spirit of going for radical product innovation in the first place. Or can they find a niche under the German model of constant “innovation” to keep one’s products on the cutting edge globally? All that can be reliably said at this stage is that Chinese leaders recognize the problem. They have begun a process of encouraging innovation and are revamping educational structures and priorities. Some of China’s leading universities have started up programs dedicated to honing the innovation potential of the country’s future managers. China’s leaders may also harbor the hope that China can compartmentalize innovation, in the sense of becoming very innovative within the existing political structures. It worked for Germany in the past, they might be tempted to argue. But that may prove to be a fallacious argument. After all, this is 2013, not 1913. It is hard to imagine any German today arguing in earnest against the suggestion that democracy is a great facilitator or accelerator of innovation. Which way will China tilt? Finally, will the preferred style of management organization have any impact on China’s future? Will China follow more of the U.S. or the German example? A culture that is broadly focused on harmony makes it more likely for China to follow in Germany’s footsteps, which has been pretty successful with a horizontal model when it comes to innovation. In reality, both of the contending approaches – the “German” and the “American” one – are bound to clash within China itself. Why? Because both are going to be practiced at the same time. China’s large state-owned enterprises are likely going to follow the horizontal model. Meanwhile, China’s still smaller and more nimble private-sector firms will embrace the vertical approach. In their own way, China’s state-owned enterprises, whether “privatized” or not yet, are more “German” in their character. How so? Because they have to obtain a lot of buy-in, including from political stakeholders, which is especially crucial in China’s case. In contrast, the privately owned firms in China are bound to follow the more top-down U.S. model. In the end, it is impossible to pre-determine the ultimate outcome of China’s corporate and innovation journey. The only thing that seems a safe bet is that, while China searches for its path to lasting prosperity, management cultures around the globe are changing to the point that they are blending ever more. 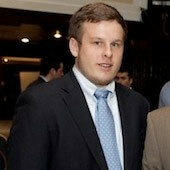 Nathan Richter is pursuing a master’s degree in management at Peking University’s HSBC Graduate Business School, in Shenzhen, China.